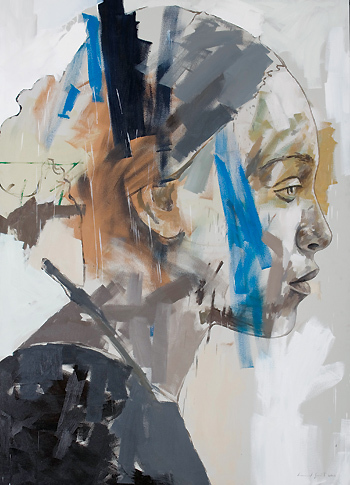 Smit was born in Pretoria and studied at the Pro Arte School of Arts from 1996 to 2000. He lives and works in Cape Town. Magnified several times bigger than life size, the scale of his human-height portraits is part of the viewer’s experience while investigating the work. Up close he wants them to absorb into the surface of the work, with the drips and swathes of paint. Only then will they step away to discover the image and the power of the portraits – they are at once figurative and abstract. "I am confronted with the fact that I live in Africa, and I draw inspiration from the people I see in my daily life. It is this 'regular person' that I have selected to become part of my process."